Birdman is undoubtedly the film of the year which will create the most debate, different interpretations and outright confusion amongst its audience. Watching this was probably the first time since Inception (2010) that I have been left absolutely baffled by a film. Alejandro González Iñárritu puts together a theatre based, small budget “visual experiment” (Michael Keaton states in the recent SAG Foundation ‘Conversations’ interview), with an impressive cast, delivering some incredible acting, most notably from Emma Stone and the lead, Michael Keaton. 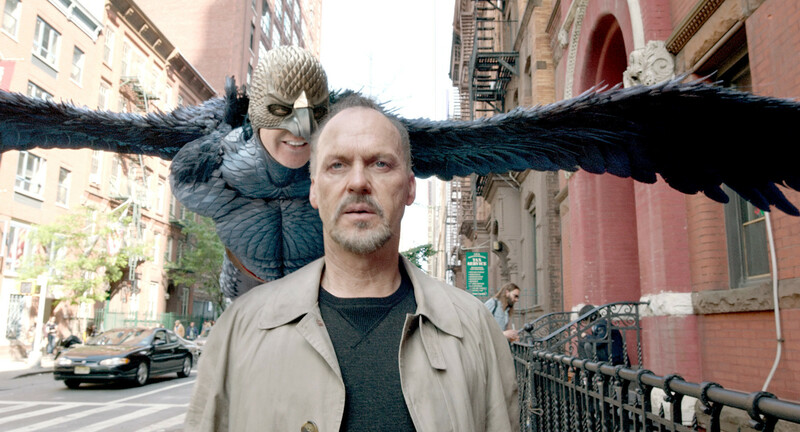 Michael Keaton plays Riggan Thomas, an ex-movie superhero known as ‘Birdman’ trying to revive his career through writing, directing and starring in his own Broadway show. With a troubled daughter working as his assistant (Emma Stone) and a variety of complicated characters surrounding him, this film tackles the life of a film actor versus a stage actor, giving the viewer an excellent of idea of the world of film and theatre. However, to take this film as simply what the descriptions state, personally does not make it as epic a feature as most people are saying. From the use of drumming sounds in tense, built-up moments, and the incorporation of a metronome into deep and thoughtful situations where Riggan was clearly troubled, I feel that there was more psychological depth to this film than people are giving it credit for. Half way through the film, I felt like I had sussed it, but the brilliance of Birdman is that the viewer is always kept in the dark. Is this simply a story about an ex film actor dealing with the pressures and troubles of trying to revive his career on stage, or is this representation of the theatre in fact an illusion and figment of Riggan’s imagination, who could perhaps be living in a mental institution (very similar to the story of Shutter Island (2010)). The constant voices in his head of his past character ‘Birdman’ among many other spoilers make me believe firmly in the latter. Recommendation: Simply watch this to join the debate! Superb acting, so it is a great watch! Try catch a cheaper screening of it, especially if cliff-hangers just straight out annoy you.